How do I change my Ubisoft Account password? How to change your Ubisoft Account Password. What should I choose to be my Uplay login password? I forgot my password. Is there a way you can send it to me? 2. Navigate to the Security Settings tab and click the Change Password button in the Password section. 3. A message will pop up, informing you that an email has been sent to the email listed on your account. 4. Please read the email, and follow the instructions provided to complete the process. 5. 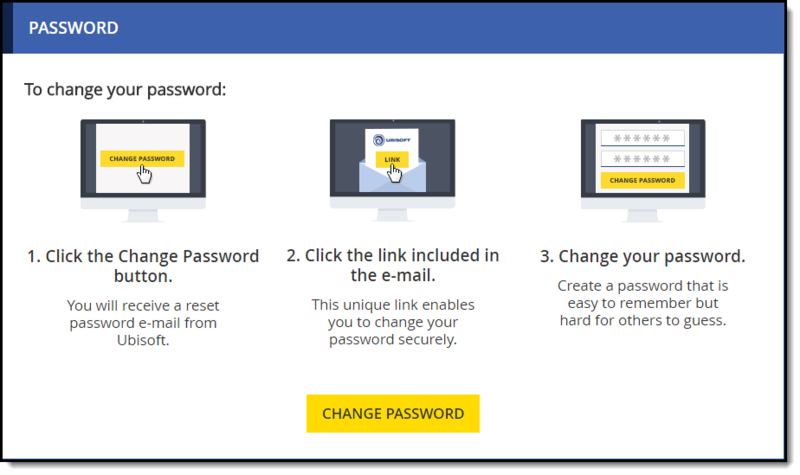 Clicking the link in the email will take you to a prompt where you will only need to enter your new Password and re-enter to Confirm Password. Please be original in choosing your password. We recommend that your password be something easy to remember. For security reasons, please do not use anything that might easily connect your password to you. • Passwords must be at least 8 characters long and a maximum of 16 characters. • Passwords are case sensitive. Your user name cannot appear in your password. • Passwords may contain letters and numbers, and it must contain at least one of each. • It may also contain underscores (_), dots (.) and dashes (-). • You are responsible for your password. Never give it to someone else! Ubisoft employees will never ask you for your password. 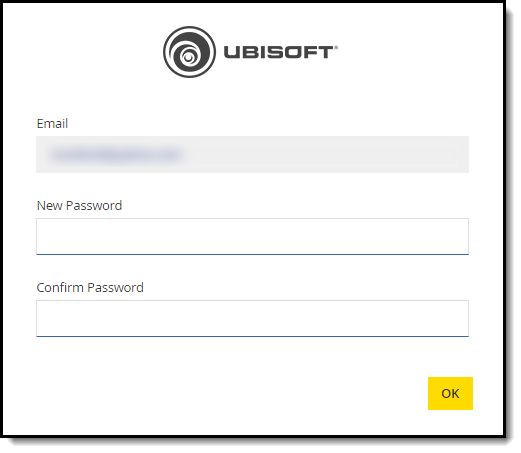 For account security, Ubisoft Support representatives cannot see your previous or current password. Please check your Spam/Junk folder in your email. It is possible this may have been flagged as Spam and, therefore, missed your inbox.